I just finished writing a response to a Request for Proposal and found an interesting theme in my response. The Stakeholder Analysis is the most important tool in the Project Manager’s toolkit. With a great Stakeholder Analysis you will have information that is key to planning for project communications, organizational change management, training, rollout plans and notifications, risk management, you name it. This will be an equally valuable key in planning Business Analysis activities and communications. While I refer to this as a Project Management tool, the fact is it is a complete project tool. It is not something that can be completed by the Project Manager in a vacuum, nor is it something that should be written once and then filed away. As you work the project you will get additional information in many different ways that will make project plans and activities go more smoothly. I am an avid poker player. Most poker books discuss the strategy of writing notes on other players as soon as the poker session is over (or even better during). The point of this strategy is to have better recall on how other players act in certain circumstances so that you can learn what their play says about the strength of their had hand and what plays you can use to increase your odds of making money. Another useful analogy is the star sales person who takes careful notes on all customers, actual or prospective. With this information they can proactively provide meaningful leads to customers on items they desire or would benefit from. They can also avoid wasting time on cold calls that do not have a high likelihood of resulting in a sale. Finally, it will provide information to support inventory decisions, avoiding costly mistakes of purchasing items that are not likely to sell. What information is the Stakeholder Analysis providing that will increase our chances of success? What is their stake in the project (what do they care about)? What type of influence and impact can they have on the project? What do they expect from the project and/or the project team? What risks to they present to the project? What risks to they perceive for the project? What is the best way to keep them apprised of project status and information given their stake, interests, and communication preferences? What other groups or individuals do they know that have a stake or interest in the project? Think of the Stakeholder Analysis has your very own Customer Relationship Management (CRM) tool. You will not be able to answer all of the questions upon first making an entry. As you learn more about the stakeholder and the project, additional information will become available. The Stakeholder Analysis should continue to grow throughout the project as you and the project team gain information. Update the Stakeholder Analysis as you learn more about your stakeholders, and the strategies and tools that work best for meeting their needs as well as gaining their trust and cooperation. At the same time, update any project plans that can be improved given what you now know. Plans were not meant to be set in stone but rather to be improved upon as additional information becomes available. Begin documenting what you know about the stakeholders. Remember, project team members are stakeholders too. Once your initial list is completed, send out an email introducing yourself and the project with an indication that they have been identified as a stakeholder and give them an opportunity to state their interest and communication preferences related to the project as well as provide information on additional stakeholders who may have been missed. Ask project team members and other key stakeholders to review the Stakeholder Analysis with you to provide additional information. Continually update the Stakeholder Analysis as you gain information throughout the life of the project. You may uncover a hidden key to the success of implementation while in the stabilization phase of product development. Record it, use it. Use the information in all planning activities. Use the information again in reviewing plans or conducting lessons learned to determine if adjustments are needed. Information is the key to success. 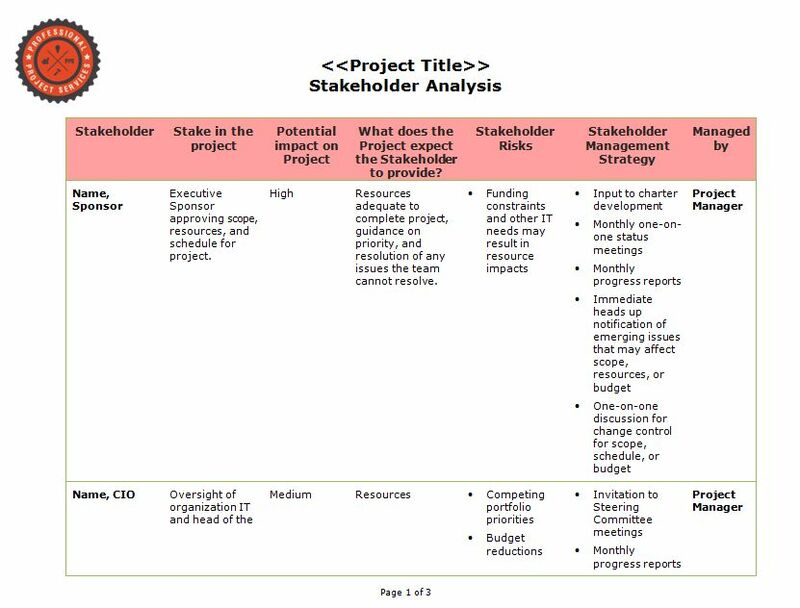 Use the Stakeholder Analysis to structure your information gathering, record the information you learn, and advise you on actions that will result in the greatest chances of project success. I welcome any and all thoughts or experiences you have had in working with stakeholders. As the author said, this is a project or program wide effort with the manager directing development and maintenance of the list/s. Discipline or Geographic areas need to produce related lists, and the coordinator will assemble and maintain the consolidated listing. The key is to identify the various divisions of stakeholders, assign responsibility for maintenance, and identification of opportunities or risks. The final key is communication up and down the organization, plus to and from the client, licencor, local agencies and community at large. It is a big job that can only be handled by project-wide participation. An interesting outcome is an increased feeling of ownership among the various levels of your project. Plus it provides a network to enhance the quality of lessons learned. From these comments you may deduce that the network created for one application, can serve to develop many data streams of value to the project. The development of the network takes time at the beginning, but when it becomes second nature, the cost small but provides benefits to all those with a stake in your project. Thank you for the insight. I especially like “An interesting outcome is an increased feeling of ownership among the various levels of your project. Plus it provides a network to enhance the quality of lessons learned.” So very true. thank you for sharing your insights. Great post.